Simplicity of deployment for wireless access points is at the heart of NBASE-T technology. Simplicity is also a core value for Cisco Meraki, which is just one of the many reasons the company works so well with NBASE-T. Enabling the simple deployment of Wireless Access Points as they evolve (802.11AC Wave 1 -> 802.11AC Wave 2 -> 802.11ax ) is critical to the Cisco Meraki customer base. NBASE-T provides the wired bandwidth needed for excellent user experience, and the downshift feature only found in NBASE-T, allows for easy deployment. Thirty years seems like a lifetime when it comes to Ethernet technology and the vast improvements, updates and ways it has changed every aspect of our personal and professional lives. Tam Dell’Oro has been researching the industry these past three decades. She has predicted and tracked major breakthroughs that have transformed the industry. She has seen many cases where promising new networking technologies have fallen short. So, it is no small feat to have her say, “NBASE-T technology is significantly impacting the market with the biggest transition we’ve seen in campus switching since 2000.” Since the NBASE-T Alliance was formed in 2014, the mission has been to radically change the industry by providing solutions benefitting nearly everyone in the market. With a strong ecosystem of companies providing input and support, the alliance has done just that and is now continuing this success by merging with the Ethernet Alliance. NBASE-T is a natural fit for NXP’s broad family of Arm-based Layerscape communications processors. From sub-1W single core devices to 16-core power houses, NXP takes advantage of NBASE-T enabling ease-of-upgrade, future proofing, and ease of management. Fast wired and wireless network is just expected today. Network evolution demands that we unleash each device allowing the network to perform at its best. Whether you are a business owner, or running a LAN gaming party, enabling the best speed is critical. Multi-gig switches and end points provide the performance you need, over the wiring you already have. As data and video bandwidth accelerate across the client PC ecosystem, and wireless and internet infrastructure capabilities continue their relentless growth, Intel believes 2.5GBASE-T Ethernet is poised to be the next step in client wired network connectivity. From small server upgrades, notebook docking, to desktop and home gateway connectivity, we believe 2.5GBASE-T offers a compelling and affordable upgrade that runs seamlessly over existing CAT 5e infrastructure. NBASE-T technology is poised to replace 1000BASE-T, Gigabit Ethernet, as the workhorse for enterprise ethernet deployment, in addition to enabling a variety of new applications. The path to upgrade beyond gigabit ethernet in the enterprise has been more than 10 years in the making. 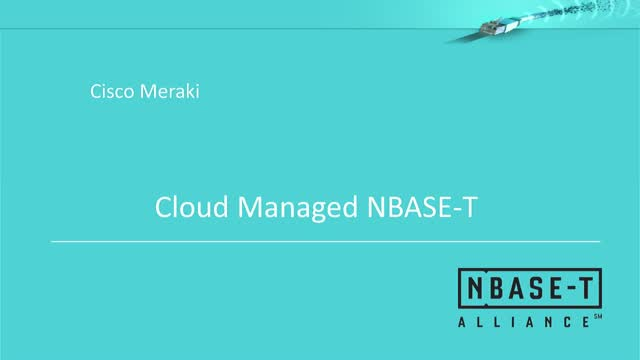 NBASE-T leveraged lessons learned from 10GBASE-T, resulting in a quick path to a standard and successful deployments across many applications. The experience of NBASE-T and 802.3bz continue to impact wired ethernet standards in development. NBASE-T and the growth of the wireless network is expanding the Campus network. With the new generation of 802.11ax access points supporting NBASE-T ports, this trend will only accelerate. Dell’Oro Group expects a major refresh of the Ethernet Switch Campus market as 802.11ax shipments ramp up, taking NBASE-T to 20% of Campus Switch ports by 2022. This transition will enable enterprises to transform their networks, support new high bandwidth devices, and provide the “always on” network experience expected today. New structured cabling standards have added deployment options that will make a huge difference for users of NBASE-T devices. The new options for connecting devices to the network provide more flexibility, enabling users to overcome common deployment challenges. ANSI/TIA568.2 revision ”D” adds 28 gauge patch cords, and a new type of permanent link named “Modular Plug Terminated Link” (MPTL). These additions simplify connecting NBASE-T devices to the network. It may not sound exciting, but cabling is one of the most important decisions made whether you are constructing a new hospital or just updating your home. Cabling is the foundation your network is built on and will have an impact for years to come. NBASE-T technology is projected to be the fastest growing part of the Ethernet market and a key reason is that it provides 10x the speed on the most common BASE-T cables. NBASE-T leverages the Cat5e and Cat6 outlets that make up more than 90% of today’s 1.6 billion BASE-T outlets. But what does the market look like moving forward? What cables are being installed today and in the future? What kinds of devices will they serve? What’s the role for NBASE-T technology in the next 5 years? NBASE-T technology enables network evolution with up to 10x faster speed with no re-cabling. Great opportunity for business, but what’s involved in testing your cables for NBASE-T before or after deployment? How do you ensure that your cable plant is reaching its full potential for all your business needs? Can a cabling plant’s performance be improved to support NBASE-T? Today’s workplace technology needs are evolving at a rapid pace and multiple trends are impacting the way corporate LAN designs are being designed and implemented. Constant evolution of network speeds, new classes of ethernet devices, move to open office space, wireless first connectivity and remote powering, puts pressure on the traditional infrastructure networks. For existing installations, best practices and mitigation procedures can help the network support new business practices. For new installations, cabling guidelines and standards around NBASE-T and 4PPoE can provide the best long-term value to the business. The NBASE-T Alliance is proud that 2.5G/5G technology went from initial IEEE 802.3 discussions to the approval of IEEE 802.3bz in less than two years. Enabling network evolution by providing up to 10x faster speed, without pulling cables or requiring building construction, is easily understood. But while the claims sounded great, we need to be able to back them up. The best way to do this is enlist a well-respected, neutral organization like the UNH-IOL to help. The UNH-IOL hosts industry plugfests and provides electrical conformance testing helping to validate NBASE-T value. Think NBASE-T is just for the networking market? Check out this webinar to learn how NBASE-T technology has become an important factor in the exponentially fast-growing imaging market. Imaging systems that rely on real-time video for automated processing and analysis leverage the bandwidth and cabling benefits of NBASE-T across a widening range of quality inspection, security and defense, and medical imaging applications. NBASE-T technology was developed to boost the speed of Cat5e/Cat6 twisted-pair structured cabling well beyond it’s 1 Gbps limit. Delivering up to 2.5 or 5 Gbps using the installed base of 1.3+ billion Cat5e and Cat6 outlets, NBASE-T solutions are helping users transform their networks in the most cost-effective, least disruptive manner. In less than four years, NBASE-T looks set to succeed 1000BASE-T as the default Ethernet according to Alan Weckel, co-founder and technology analyst with 650 Group.